"I remember reading a description of a white pizza in one of my chick lit books and wanting to try it out. This recipe fits that description to a T, and I find it very simple but really quite yummy." Place the pizza crust on a baking sheet and drizzle with 1 tablespoon of olive oil. 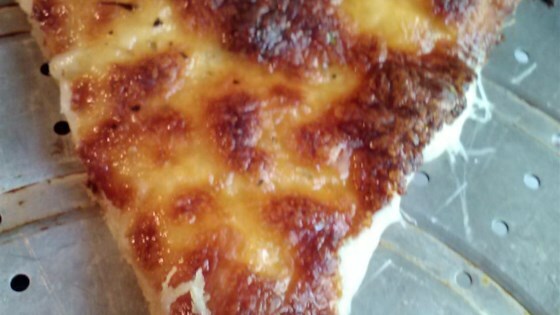 Sprinkle the mozzarella cheese evenly over the crust and top with pieces of garlic. Bake in the preheated oven until cheese is bubbly and starting to brown, about 15 minutes. Drizzle with a little bit more olive oil and cut into wedges to serve. See how to make the pizza meatball dip created by Lombardi's Pizza. This was simple but really good. I did spread some crushed garlic on the crust after the olive oil then put the mozzarella and added some parmesean. The kids loved it! This was really good, and so easy. To make it 5 stars, I would add some chicken and maybe even some alfredo sauce. But still yummy just as it's written. This recipe is very good and easy! I used minced garlic from the jar to save some time and added some bacon and fresh basil as a topping. Delicious! This was perfect for us, people sensitive to tomato sauce. It smelled almost like garlic bread. I grated my garlic and spread it under the cheese. Yum! Will be makung again. A delicious base recipe! I used a Boboli pizza crust, and I added chopped fresh basil on top before baking. Also, I minced the garlic and rubbed it on the crust with the olive oil. So easy and tasty. Great to cut into thin strips and serve like breadsticks. Also delicious to serve with pasta. Will definitely reuse this recipe!